UNCTAD monitoring shows that, in 2013, 59 countries and economies adopted 87 policy measures affecting foreign investment. National investment policymaking remained geared towards investment promotion and liberalization. 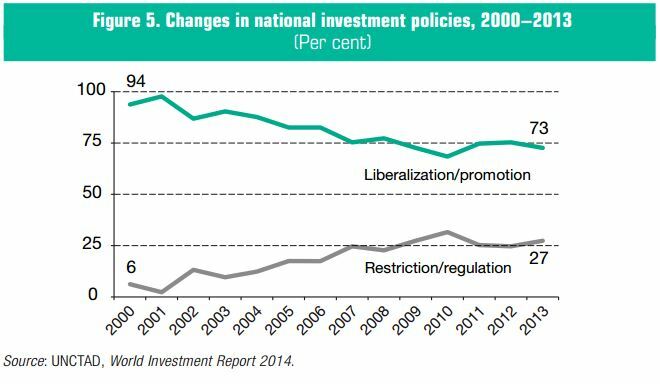 At the same time, the overall share of regulatory or restrictive investment policies further increased from 25 to 27 per cent (figure 5). Investment liberalization measures included a number of privatizations in transition economies. The majority of foreign-investment-specific liberalization measures reported were in Asia; most related to the telecommunications industry and the energy sector. Newly introduced FDI restrictions and regulations included a number of non-approvals of foreign investment projects. A recent phenomenon is the effort by governments to prevent divestments by foreign investors. Affected by economic crises and persistently high domestic unemployment, some countries have introduced new approval requirements for relocations and lay-offs. In addition, some home countries have started to promote reshoring of overseas investment by their TNCs. Incentives are widely used by governments as a policy instrument for attracting investment, despite persistent criticism that they are economically inefficient and lead to misallocations of public funds. In 2013, more than half of new liberalization, promotion or facilitation measures related to the provision of investment incentives. According to UNCTAD’s most recent survey of investment promotion agencies (IPAs), the main objective of investment incentives is job creation, followed by technology transfer and export promotion, while the most important target industry is IT and business services, followed by agriculture and tourism. Despite their growing importance in national and global policy agendas, environmental protection and development of disadvantaged regions do not rank high in current promotion strategies of IPAs. Linking investment incentives schemes to the SDGs could make them a more effective policy tool to remedy market failures and could offer a response to the criticism raised against the way investment incentives have traditionally been used. Governments should also carefully assess their incentives strategies and strengthen their monitoring and evaluation practices. With the addition of 44 new treaties, the global IIA regime reached close to 3,240 at the end of 2013 (figure 6). The year brought an increasing dichotomy in investment treaty making. An increasing number of developing countries are disengaging from the regime in Africa, Asia and Latin America. At the same time, there is an “up-scaling” trend in treaty making, which manifests itself in increasing dynamism (with more countries participating in ever faster sequenced negotiating rounds) and in an increasing depth and breadth of issues addressed. Today, IIA negotiators increasingly take novel approaches to existing IIA provisions and add new issues to the negotiating agenda. The inclusion of sustainable development features and provisions that bring a liberalization dimension to IIAs and/or strengthen certain investment protection elements are examples in point. Negotiations of megaregional agreements have become increasingly prominent in the public debate, attracting both criticism and support from different stakeholders. Key concerns relate to their potential impact on contracting parties’ regulatory space and sustainable development. Megaregionals are broad economic agreements among a group of countries that have a significant combined economic weight and in which investment is one of the key subject areas covered. Taking seven of these negotiations together, they involve a total of 88 developed and developing countries. If concluded, they are likely to have important implications for the current multi-layered international investment regime and global investment patterns. Megaregional agreements could have systemic implications for the IIA regime: they could either contribute to a consolidation of the existing treaty landscape or they could create further inconsistencies through overlap with existing IIAs – including those at the plurilateral level (figure 7). 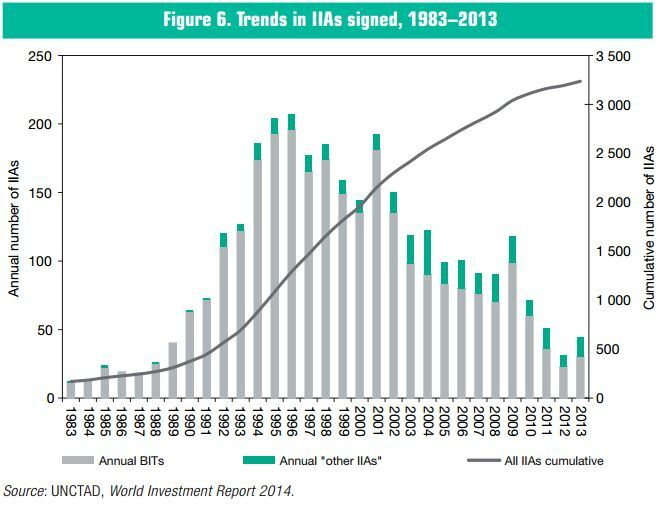 For example, six major megaregional agreements overlap with 140 existing IIAs but would create 200 new bilateral investment-treaty relationships. 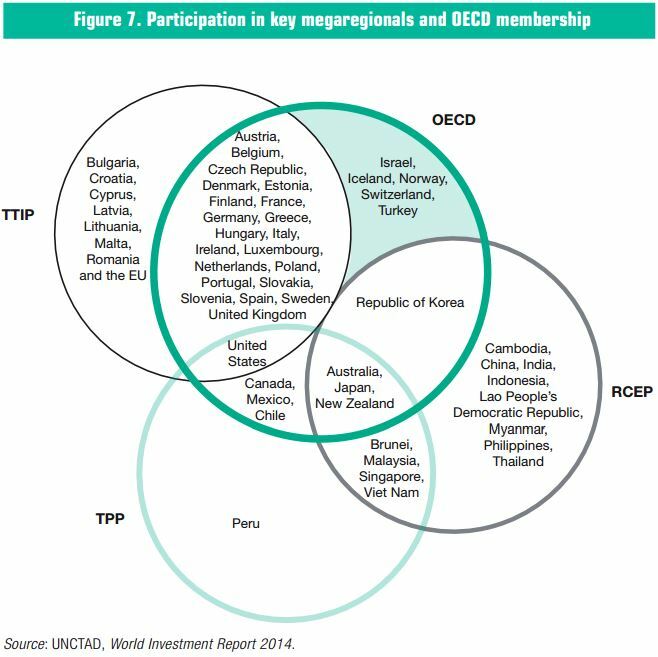 Megaregional agreements could also marginalize non-participating third parties. Negotiators need to give careful consideration to these systemic implications. Transparency in rule making, with broad stakeholder engagement, can help in finding optimal solutions and ensure buy-in from those affected by a treaty. The year 2013 saw the second largest number of known investment arbitrations filed in a single year (56), bringing the total number of known cases to 568. Of the new claims, more than 40 per cent were brought against member States of the European Union (EU), with all but one of them being intra-EU cases. Investors continued to challenge a broad number of measures in various policy areas, particularly in the renewable energy sector. The past year also saw at least 37 arbitral decisions – 23 of which are in the public domain – and the second highest known award so far ($935 million plus interest). With the potential inclusion of investment arbitration in “megaregional agreements”, investor-State dispute settlement (ISDS) is at the centre of public attention. While almost all countries are parties to one or several IIAs, many are dissatisfied with the current regime. Concerns relate mostly to the development dimension of IIAs; the balance between the rights and obligations of investors and States; and the systemic complexity of the IIA regime. Countries’ current efforts to address these challenges reveal four different paths of action: (i) some aim to maintain the status quo, largely refraining from changes in the way they enter into new IIA commitments; (ii) some are disengaging from the IIA regime, unilaterally terminating existing treaties or denouncing multilateral arbitration conventions; and (iii) some are implementing selective adjustments, modifying models for future treaties but leaving the treaty core and the body of existing treaties largely untouched. Finally, (iv) there is the path of systematic reform that aims to comprehensively address the IIA regime’s challenges in a holistic manner. While each of these paths has benefits and drawbacks, systemic reform could effectively address the complexities of the IIA regime and bring it in line with the sustainable development imperative. Such a reform process could follow a gradual approach with carefully sequenced actions: (i) defining the areas for reform (identifying key and emerging issues and lessons learned, and building consensus on what could and should be changed, and on what should and could not be changed), (ii) designing a roadmap for reform (identifying different options for reform, assessing pros and cons, and agreeing on the sequencing of actions), and (iii) implementing it at the national, bilateral and regional levels. A multilateral focal point like UNCTAD could support such a holistic, coordinated and sustainability-oriented approach to IIA reform through its policy analysis, technical assistance and consensus building. The World Investment Forum could provide the platform, and the Investment Policy Framework for Sustainable Development (IPFSD) the guidance.